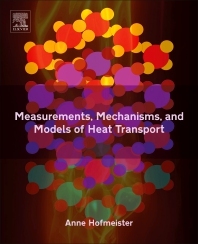 Measurements, Mechanisms, and Models of Heat Transport offers an interdisciplinary approach to the dynamic response of matter to energy input. Using a combination of fundamental principles of physics, recent developments in measuring time-dependent heat conduction, and analytical mathematics, this timely reference summarizes the relative advantages of currently used methods, and remediates flaws in modern models and their historical precursors. Geophysicists, physical chemists, and engineers will find the book to be a valuable resource for its discussions of radiative transfer models and the kinetic theory of gas, amended to account for atomic collisions being inelastic. This book is a prelude to a companion volume on the thermal state, formation, and evolution of planets. Anne M. Hofmeister is research professor in the Department of Earth and Planetary Sciences at Washington University in St. Louis. She received an MS in physics from University of Illinois and a PhD in geology from California Institute of Technology, United States and has received several fellowships and awards. She has served as editor of American Mineralogist and was recently the keynote speaker at the European Conference on Mineral Spectroscopy. Her research interests include heat transport, thermodynamics, interaction of light with matter, and the applications of such studies to planetary science, earth science, astronomy, and materials science. She has authored over 140 peer-reviewed publications in astronomy, physics, geology, and planetary science journals.